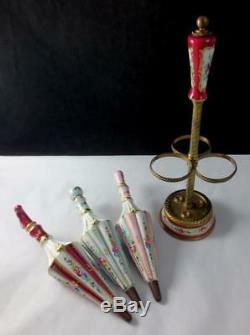 Vintage PARIS FRANCE Umbrella Stand Shape HAND PAINTED PORCELAIN PERFUME BOTTLE SET. 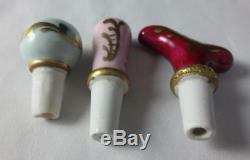 This is a somewhat hard to find set of decorative porcelain perfume bottles from Paris France. 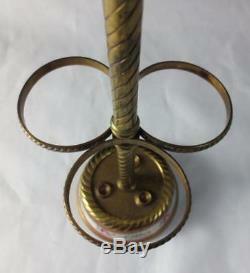 It is in the form of an umbrella stand, holding three umbrella-shape bottles. The stand measures 10-1/4 high. 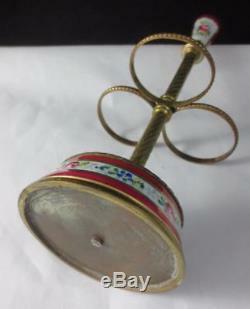 The round base measures 3 in diameter. The perfume bottles have an average length of 7. Each perfume bottle is decorated with a different color stripe. There is burgundy, pink, and light blue, alternating with white stripes decorated with dainty hand painted flowers. The stoppers' tops vary in shape. They are a bit rough on their bottoms. 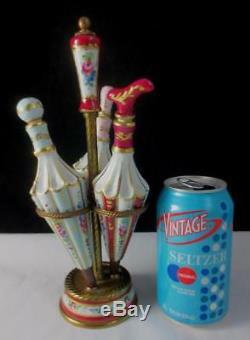 There is no lingering scent from inside the bottles; the set may have only been used for display. 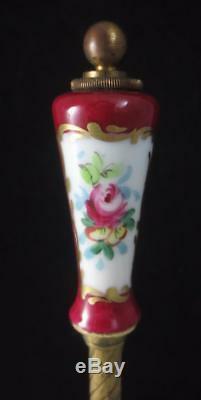 The stand has a hand painted enamel handle and base. The overall condition is very good. Aside from the rough bottom edges of the stoppers, there are no chips, cracks or crazing to the porcelain. The perfume set will be well packed. Please do not ask me to falsify documents. I can hold the first item up to 7 days only. Do not pay for the first item until I send the combined invoice for all items. I pack carefully with bubble wrap and plenty of padding. It is calculated using the weight of the package and the distance it has to travel. I usually offer a choice of Priority (fastest), Parcel Post (good for heavy items), and First Class for packages under 13 ounces. All sales are considered final. Ask questions if you are unsure. You have the luxury of having them delivered to your door. - I research and describe each item to the best of my knowledge. I will always accept any additional information that you may have. - I always clean my items if appropriate. Please keep in mind that most of my items are old. There will probably be signs of age and use, and small imperfections. I describe them as I see them, but I'm only human and it's possible I can miss something. I will not mention each microscopic dot. Auctiva Offers Free Image Hosting and Editing. 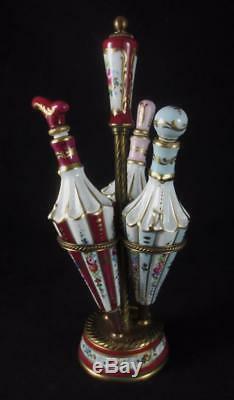 The item "Vtg PARIS FRANCE Umbrella Stand Shape HAND PAINTED PORCELAIN PERFUME BOTTLE SET" is in sale since Monday, November 27, 2017. 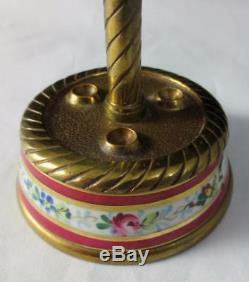 This item is in the category "Collectibles\Vanity, Perfume & Shaving\Perfumes\Other Perfume Collectibles". The seller is "pugsley_pugsley" and is located in Farmingdale, New York.